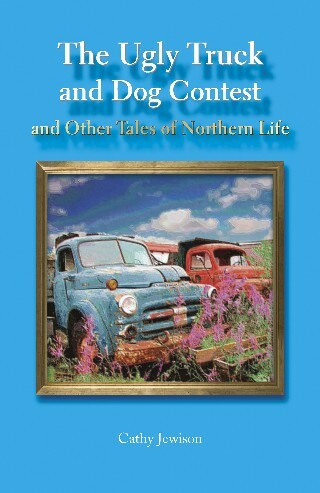 In the preface to The Ugly Truck and Dog Contest, Cathy Jewison writes that the stories within, while fictional, are based upon some of the "quirky and unique" aspects of life here in Yellowknife. Later she talks about our "collective eccentricities." In closing, she reminds us once again that life in northern Canada is "considerably different." I wasn't off to a good start. Not that I'm offended. Like any good Northerner, I think what she's saying is true. Hell, if I didn't think it was quirky, unique and considerably different here, I'd be gone. My issue was the heavy-handed emphasis on what the stories should say for themselves. The preface is a little too dimple rooting. Fortunately, Jewison quickly won me back. The Ugly Truck and Dog Contest is a collection of humorous short stories set in Yellowknife, chocked full of folksy charm. The characters never really rise above the level of caricatures, their motivations are psychology-lite, and yet Jewison pulls it off. It's comfortable, it's fun, and captures many of the reasons most of us love it here. Yellowknife may not be perfect, but it's not the time or place to get into all that. That sort of heavy handed approach to the preface reminds me of the old saying: if you have to tell people you are cool, you're not. Still sounds like a pleasant diversion. Hmmm ... there was this affection/obsession with trucks in 'The Wildfire Season' too. I chalked it up as more of a "male thing" but perhaps there's more to it. Would you care to enlighten us, John? Barbara: The thing is, the characters were quirky. It just didn't to be pointed out. Wanda: It's a very rugged, outdoorsy place and pickup trucks and SUVs are more common than cars. I, however, have owned a Cavalier, a PT Cruiser, and a Dodge Caravan since I've lived in the North-- none of which make me the most macho of guys. But whatever, they get me from point A to point B and I'm not all that rugged or outdoorsy myself, so it's all good. Ever since I read Late Nights on Air by Elizabeth Hay, I've wanted to read more Yellownife fiction. Thanks for bringing this book to my attention. I added it to my TBR but it looks like a hard one to get a hold of. The only place I could find it is Chapters and I have to order it from their website. It takes 3-5 weeks.